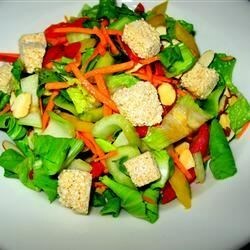 "This crispy salad uses authentic Asian ingredients and the sauce is delicious. If you can find mirin in an Asian grocery store, it makes it much more authentic and not too sweet." Whisk together the oil, vinegar, soy sauce, mirin, and sesame seeds in a small bowl, then set aside. Toss together the romaine, bok choy, carrot, almonds, and croutons in a large bowl. Pour the dressing over the salad, toss to coat, and serve immediately. salad was excellent with mandarin oranges and yellow peppers added. dressing was good, but a bit too oily. I finally found baby bok choy in an asian market! It makes a refreshing salad that would be good with cucumber, too. I used only 2 T oil and added red and yellow peppers. Will try the mandarin oranges next time. Instead of sesame seeds and croutons I used Mrs. May's sesame crunch. With a salad, of all of its sections, it's the dressing that needs the directions. Cause if the dressing don't sing, then forget the whole thing -- it's no salad, it's a veggie collection. Delicious! Everyone loved it. Great on a hot day!